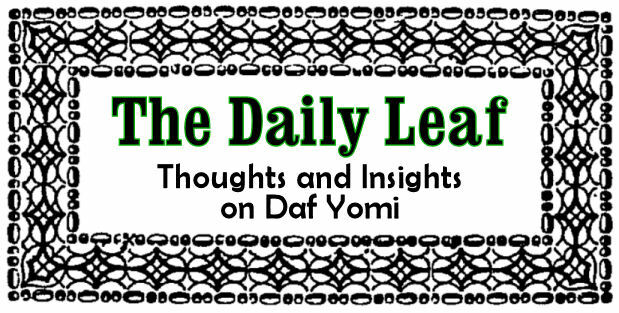 The Daily Leaf: :כ"ב Which direction? Let's analyze the scenario as רש"י describes it. The ideal is to have the צואה directly behind him. However, the only way to accomplish would seem to be by moving forward. If one is davening with a river directly in front of them, they certainly cannot move forward. Therefore, in such a case, it is sufficient to move to the side, even though the צואה will then be to the side of the מתפלל. Isn't there a simple solution? After moving away, turn your body so that the צואה is now behind you. We will learn later on (דף ל) that one needs to face a specific direction when davening, depending on where they are. It would seem from the מסקנא of this גמרא that the direction requirements are more stringent than the לכתחילה aspect of having the צואה directly behind. Rather than turn one's body to have the צואה behind him, we are told that what should be done is to maintain the same direction and rely on the בדי עבד of having the צואה on the side.